Enterohepatic bacterial infections have the potential to affect multiple physiological processes of the body. Fibroblast growth factor 15/19 (FGF15 in mice, FGF19 in humans) is a hormone that functions as a central regulator of glucose, lipid and bile acid metabolism. FGF15/19 is produced in the intestine and exert its actions on the liver by signaling through the FGFR4-βKlotho receptor complex. Here, we examined the in vivo effects of enterohepatic bacterial infection over the FGF15 endocrine axis. Infection triggered significant reductions in the intestinal expression of Fgf15 and its hepatic receptor components (Fgfr4 and Klb (βKlotho)). Infection also resulted in alterations of the expression pattern of genes involved in hepatobiliary function, marked reduction in gallbladder bile volumes and accumulation of hepatic cholesterol and triglycerides. The decrease in ileal Fgf15 expression was associated with liver bacterial colonization and hepatobiliary pathophysiology rather than with direct intestinal bacterial pathogenesis. Bacterial pathogens of the enterohepatic system can disturb the homeostasis of the FGF15/19-FGFR4 endocrine axis. These results open up a possible link between FGF15/19-FGFR4 disruptions and the metabolic and nutritional disorders observed in infectious diseases. Alteration of the host’s metabolism is common in infectious diseases; it can lead to patient malnutrition and the need for nutritional support [1, 2]. Infection-driven metabolic changes are characterized by an accelerated flux of glucose, lipids, proteins and amino acids that may result in net protein loss and diabetic-like hyperglycemia [1, 2]. Significant metabolic disorders have been observed in natural and experimental infections with the bacterium Salmonella enterica, including changes of the lipid and protein profiles and widespread hormonal imbalances [1, 3, 4]. In humans, Salmonella enterica serovar Typhi causes typhoid fever, a disease characterized by multi-organ bacterial colonization with common immunopathological manifestations in the gastrointestinal tract and the hepatobiliary system . The molecular and physiological bases of the metabolic disorders observed during infection are not fully understood. In this work, we examined the disruption of the enterohepatic fibroblast growth factor 15/19 (FGF15/19)-fibroblast growth factor receptor 4 (FGFR4) endocrine axis during bacterial infections of the enterohepatic system. FGF15/19 (FGF15 in mice, FGF19 in humans) is an endocrine factor secreted by intestinal enterocytes . FGF15/19 has a crucial role in the control of whole body glucose and lipid metabolism and energy expenditure [7, 8]. It is also a key regulator of de novo synthesis of bile acids via the repression of cholesterol 7 alpha hydroxylase (CYP7A1) expression in hepatocytes . In addition, FGF15 represses the apical Na+-dependent bile acid transporter (ASBT) expression in hepatic cholangiocytes  and facilitates gallbladder filling by promoting gallbladder muscle distension . Through these functions, FGF15/19 closes an important negative feedback loop in the regulation of bile acid homeostasis. Signaling to hepatic target cells occurs through the interaction of FGF15/19 with the tyrosine kinase receptor fibroblast growth factor receptor 4 (FGFR4) and also requires the protein βKlotho. Mice genetically deficient for Fgf15, Fgfr4 or Klb (βKlotho) have similar biliary phenotypes with higher levels of CYP7A1 and increased synthesis of bile acids [6, 12–14]. Reduced FGF19 levels have been observed in patients with inflammatory bowel disease  and chronic idiopathic bile acid diarrhea . On the other hand, patients with insulin resistance and non-alcoholic fatty liver disease, as well as extrahepatic cholestasis frequently display elevated plasma levels of FGF19 [17, 18]. Using a model of murine typhoid fever, we demonstrate that Salmonella enterica infection triggers major alterations in the hepatic biliary function gene expression program, promotes accumulation of hepatic cholesterol and triglycerides and leads to a significant reduction in physiological gallbladder bile volumes. 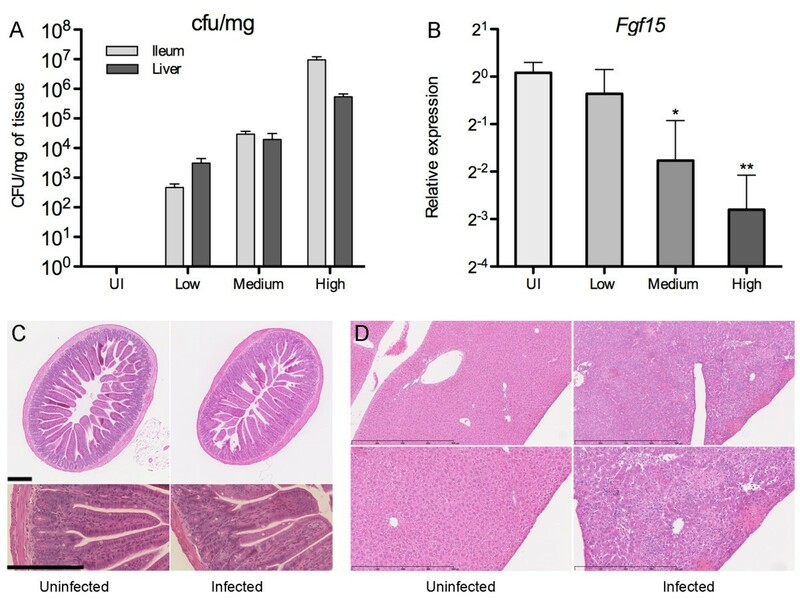 In addition, Salmonella infection causes a substantial decrease in the expression of intestinal Fgf15, accompanied by a dramatic loss of hepatic FGFR4 and βKlotho. These disturbances appear to be secondary to hepatic inflammation. Given the important role of the FGF15/19-FGFR4 endocrine axis as a central metabolic regulator, these alterations may be a major factor underlying the pathophysiology of bacterial infectious diseases. Salmonella enterica serovar Typhimurium strains SL1344 (Smr) and SB103 (invA)  and Listeria monocytogenes 10403 s (Smr)  were used in this study. Bacteria were grown overnight at 37°C in LB supplemented with 100 μg/mL streptomycin. Inoculum was prepared in sterile HEPES 100 mM, NaCl 0.9%, pH 8.0. Animal protocols were approved by the Animal Care Committees of the University of British Columbia and the University of Sherbrooke. Eight weeks-old female C57BL/6 mice (The Jackson Laboratory, Bar Harbor, USA) were infected orally with 5 × 107Salmonella SL1344, intravenously with 5 × 102Salmonella SB103 or with Listeria 10403 s (2 × 109 bacteria orally and 104 intravenously). The animals were kept with food and water ad libitum through the duration of the study and were always sacrificed during the light period (10:00 AM ± 60 minutes). The bile was collected by gallbladder resection and draining by puncture. For bacterial counts, tissues were homogenized using a Mixer Mill MM400 (Retsch GmbH) followed by plating of serial dilutions in LB plates containing 100 μg/mL streptomycin. All infection experiments were done in duplicate using a total of 8–10 mice per group. Ileum and liver samples were collected for mRNA and protein analysis. The ileal samples were taken approximately 2 cm away from the ileo-cecal junction; liver samples were taken from the central lobule. RNA was extracted using the RNeasy kit (Qiagen) and cDNA was prepared using the Quantitech Reverse Transcription kit (Qiagen). Quantitative PCR (qPCR) were done on an Eppendorf RealPlex2 system using the DyNamo SYBR Green qPCR Kit (Thermo Scientific). All reactions were done in 10 μl final volume with 40 cycles of 30 seconds denaturing at 95°C, 30 seconds annealing at 60°C and 30 seconds extension at 72°C (except the annealing temperature for Ostβ: 62°C). The relative expressions were calculated using the ddCt method and corrected for primer efficiencies according to Pfaffl et. al.. The qPCR primers are listed in Table 1. Western blots were performed using total liver tissue lysates and antibodies against CYP7A1 (Abcam, ab65596, 1:1000), FGFR4 (Abcam, ab119378, 1:500), βKlotho (R&D, AF2619, 1:2000) and actin (SIGMA A4700, 1:1000). The top sequence of each set corresponds to the forward primer and the bottom one to the reverse. All reactions were done in 10 μl final volume with 40 cycles of 30 seconds denaturing at 95°C, 30 seconds annealing at 60°C and 30 seconds extension at 72°C (except annealing temperature for Ostβ, which was 62°C). For histological analysis, tissue sections were fixed in 10% buffered formalin, embedded in paraffin and stained with H&E. Alternatively, samples fixed in 3.5% paraformaldehyde and frozen-embedded in OCT were used for immunofluorescent microscopy as previously described . Fluorescence was visualized using an Olympus IX81 microscope. Cholesterol and triglycerides were assayed in liver lysates. A total of 40-100 mg of liver was homogenized with an ultra turrax (setting 5, 4 times for 15 sec) in 3 ml of chloroform:methanol (2:1), extracted twice with water, and centrifuged for 15 minutes at 3000 g. For the triglyceride assay 200 μl of the organic layer (lower phase) was removed and evaporated under N2(g). 10 μl of Thesit (Sigma-Aldrich, St Louis, MO) was added and mixed under N2(g). Water (50 μl) was added and incubated at 37°C for 1 hr with intermittent vortexing. Aliquots of 5 μl were assayed using the Serum Triglyceride Determination kit (Sigma-Aldrich, St Louis, MO) modified for a 96-well plate, calibrated with a trioleate (Sigma-Aldrich, St Louis, MO) standard curve. The cholesterol assay was performed at the same time but 500 μl of the organic layer (lower phase) was removed after the centrifugation step and evaporated under N2(g). 50 μl of isopropanol was then added to the dried down lipids and mixed by vortexing. Aliquots of 2 μl were then assayed using the Cholesterol E kit (Wako Chemicals USA, Richmond, USA). Data processing and statistical analyses were performed using GraphPad Prism5. Student’s t test was applied to all sets of data for statistical comparisons between groups, the graphs show the means and the standard errors of the mean. The terminal ileum is the main site of production of FGF15, it is also a major port of entry for Salmonella and therefore, an important site for its pathogenesis. To determine the effect of Salmonella infection on the homeostatic synthesis of FGF15, we collected tissue samples from infected animals and analyzed the abundance of Fgf15 transcripts by qPCR. As shown in Figures 1A and 1B, the level of Fgf15 transcripts inversely correlated with bacterial counts in the liver and the ileum, with a statistically significant decrease observed at mid-high infection levels. While H&E-stained sections from the ileum of infected animals did not show signs of pathological alteration (Figure 1C), staining of liver sections demonstrated a strong inflammatory response evidenced by large lesions with widespread lymphocytic infiltration, extensive necrosis often accompanied by local hemorrhage, and zones of parenchymal degeneration characterized by disappearance of hepatocytes (Figure 1D). 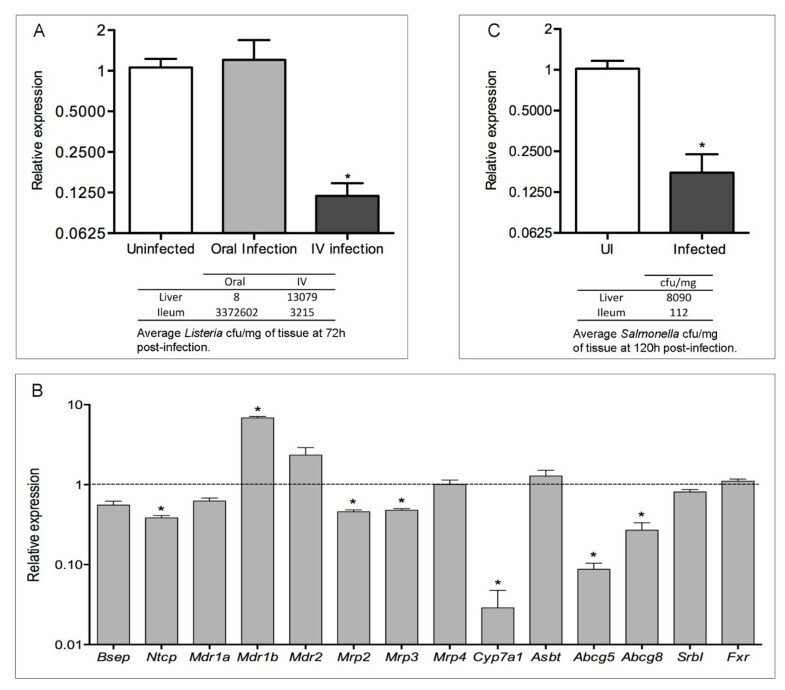 Oral infection with Salmonella typhimurium SL1344 decreases the expression of Fgf15 in the ileum. (A) bacterial counts in infected ilea and livers; animals were arbitrarily grouped into low, medium and high infection levels (100-103, 104-105 and >106 cfu/mg, respectively roughly corresponding to 72, 96 and 120 hours post-infection; UI: uninfected). (B) relative levels of Fgf15 transcripts in the ilea of infected mice (data by qPCR). (C) H&E staining of ileum sections from representative uninfected and orally Salmonella-infected animals (ileal colonization of the infected animal = 2.2 × 106 cfu/mg); scale bars are 200 μm. (D) H&E staining of liver sections from representative uninfected and orally Salmonella-infected animals (liver colonization of the infected animal = 1.7 × 105 cfu/mg); scale bars are 800 and 400 μm. FGF15 is synthesized by enterocytes , which can also be invaded by Salmonella. However, the decrease in Fgf15 expression was not associated with damage to the ileal enterocyte layer (Figure 1C). This suggests that loss of ileal enterocytes is not the reason for reduced Fgf15 transcript levels. Oral infections with Listeria monocytogenes, an inefficient invader of the mouse intestinal epithelium [24, 25], showed no significant liver colonization and large numbers of intestinal bacteria but not downregulation of Fgf15 expression (Figure 2A). In contrast, intravenous infections with Listeria, which colonized the liver rapidly and triggered deccreases in the transcript levels of biliary function genes (Figure 2B), caused a significant reduction in ileal Fgf15 expression (Figure 2A). These results point to hepatic pathophysiology, rather than intestinal bacterial colonization, as the primary event driving downregulation of intestinal Fgf15 expression. Liver colonization drives the downregulation of ileal Fgf15 expression. (A) relative levels of Fgf15 transcripts in the ileum of mice infected orally or intravenously with Listeria monocytogenes. (B) transcript levels of genes involved in liver biliary metabolism in mice infected intravenously with Listeria monocytogenes, relative to the levels of uninfected animals (defined as 1, dashed line). (C) relative levels of Fgf15 transcripts in the ilea of mice infected intravenously with Salmonella typhimurium SB103 (invA), at 120 hours post-infection. Data by qPCR, *p < 0.05. To establish the role of hepatic colonization and to probe the involvement of bacterial enterocyte invasion in repressing Fgf15 expression, we carried out intravenous infections with the Salmonella invasion-deficient strain SB103 following Menendez et al.. In this type of infection, Salmonella colonization of the hepatobiliary system occurs immediately whereas colonization of the gut is delayed by 72 to 96 hours . Furthermore, the bacteria that eventually reach the intestines are unable to invade the enterocytes due to the invA mutation of this strain. As shown in Figure 2C, intravenous infection with Salmonella SB103 caused a reduction of Fgf15 transcripts abundance. Notably, such a decrease was observed with a much lower intestinal bacterial burden than those in oral infections with the wild-type strain (average 102vs. 107 cfu/mg, respectively). These results demonstrate that colonization of the hepatobiliary system by Salmonella represses the expression of intestinal Fgf15 and show that enterocyte invasion by intestinal bacteria does not play a major role on this effect. Transcription of Fgf15 in ileal enterocytes is trans-activated by the nuclear receptor FXR (Farnesoid X Receptor), upon its activation by bile acids . Expression of the FXR gene (Nr1h4) was not affected by Salmonella, regardless of the intestinal bacterial burden (data not shown). In contrast, the expression of other known intestinal FXR target genes, Fabp6 (Fatty acid binding protein 6), Nr0b2 (Small heterodimer partner, Shp)  and Osta (Organic solute transporter alpha) , was decreased by Salmonella infection in a pattern similar to that of Fgf15 with maximal, significant drops in highly-infected animals (Figure 3A). This suggests that activation of gene expression mediated by FXR is impaired during infection. Infection with Salmonella decreases the expression of FXR-target genes in the ileum. (A) Relative levels of Fabp6, Nr0b2 and Osta transcripts in the ileum of mice orally infected with Salmonella typhimurium SL1344. Animals were arbitrarily grouped into low, medium and high infection levels (100-103, 104-105 and >106 cfu/mg, respectively roughly corresponding to 72, 96 and 120 hours post-infection; UI: uninfected). (B) Fgf15 transcript levels in the ilea of uninfected mice fed 5% cholestyramine diet. Data by qPCR, **p < 0.01; ***p < 0.001; ****p < 0.0001. Colonization of the hepatobiliary system by Salmonella induces local pathological damage and inflammation , which can result in impaired synthesis of bile acids and inflammation-induced cholestasis . This may in turn, compromise intestinal FXR activation and lead to inhibition of Fgf15, Fabp6, Nr0b2 and Osta expression. To test whether the depletion of bile acids would be sufficient to decrease Fgf15 expression in vivo, we fed uninfected C57BL/6 mice with a diet supplemented with the bile acid sequestrant cholestyramine. 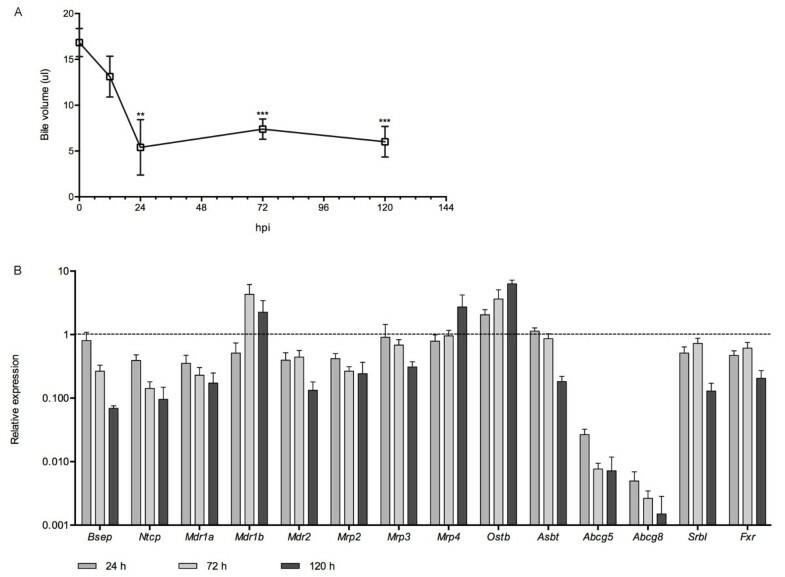 As shown in Figure 3B mice fed with cholestyramine did have significantly lower levels of Fgf15 transcripts than mice fed with a normal diet. Second, we evaluated the effects of Salmonella infection in bile production and flow. Gallbladder bile volumes were measured before and during infection; a significant reduction in volume was observed 24 hours post-infection, which did not improved over the next 4 days (Figure 4A). An expression analysis of hepatic genes involved in bile synthesis and secretion (Figure 4B), showed striking reductions in the transcript levels of the major transporters of bile acid and cholesterol (Abcb11, Slc10a1, Abcb1a, Abcg5 and Abcg8) and the induction of several genes involved in rescue from cholestasis. The mRNA (Figure 5A) and protein levels (Figure 5B) of CYP7A1, the rate-limiting enzyme in the neutral pathway of bile acids synthesis, were decreased by infection. This was accompanied by a significant accumulation of hepatic cholesterol and triglycerides (Figure 5C and Figure 5D), which collectively suggest interruption of bile synthesis and flow. Salmonella infection perturbs the host’s hepatobiliary homeostasis. (A) bile volumes recovered from the gallbladders of mice orally infected with Salmonella at the indicated hours post-infection (hpi). (B) Transcript levels of hepatic genes involved in liver biliary metabolism in mice infected with Salmonella, relative to the levels of uninfected animals (defined as 1, dashed line) at 24, 72 and 120 hours post-infection. Data by qPCR. Salmonella infection downregulates the neutral bile acid synthesis pathway. (A) relative levels of liver Cyp7a1 transcripts in mice infected with Salmonella. (B) CYP7A1 western blot of liver lysates. (C) Cholesterol and (D) triglycerides accumulation in the liver of Salmonella-infected vs. uninfected mice, (*p < 0.05; ****p < 0.0001). Signaling of FGF15 in hepatocytes requires the tyrosine kinase membrane receptor FGFR4 and the protein βKlotho. To determine if Salmonella infection disturbs the homeostasis of this pathway, we analyzed the levels of FGFR4 and βKlotho in infected and uninfected livers. Figures 6A and 6B show that the transcript levels of both Fgfr4 and Klb (βKlotho) were significantly decreased by infection. In addition, the protein levels were also reduced, as evidenced by western blot (Figure 6C). Two major FGFR4 bands were detected in uninfected animals, with apparent molecular weights of 115 and 125 KDa, likely corresponding to the core-glycosylated (FGFR4115) and fully-glycosylated, functional (FGFR4125) forms of FGFR4, respectively . Infection led to the disappearance of FGFR4125 and a decrease of FGFR4115. Immunofluorescent staining of liver sections confirmed the reduction of FGFR4 and βKlotho. 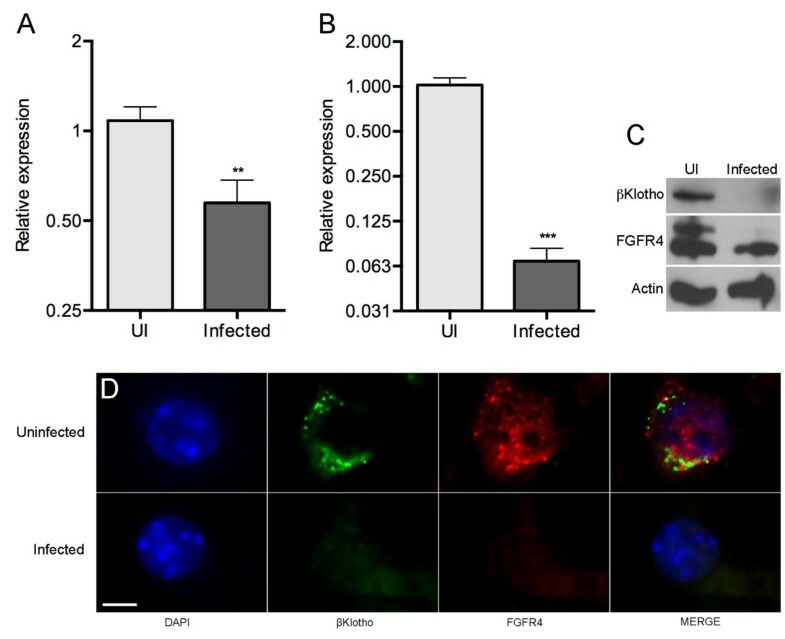 Both proteins were clearly detected in uninfected hepatocytes (Figure 6D); in contrast, hepatocytes from Salmonella-infected livers were devoid of FGFR4 and βKlotho. Salmonella infection causes the loss of the hepatic FGF15 receptor complex. (A) relative levels of Fgfr4 and (B) Klb (βKlotho) transcripts in the livers of mice infected with Salmonella. The animals analyzed in (A) and (B) are from the high-infection group in Figure 1, the data is by qPCR, (**p < 0.01; ***p < 0.001). (C) FGFR4 and βKlotho western blots of liver lysates. (D) FGFR4 and βKlotho immunostaining of uninfected (top panel) and Salmonella-infected (bottom panel) liver samples. The figure shows a single, representative hepatocyte in each case. Scale bar is 5 μm. The FGF19-FGFR4 endocrine axis is currently considered a potential intervention point for the therapy of cancer, gallstone disease, and metabolic disorders associated to the metabolic syndrome [7, 30]. Experimental administrations of FGF19 and transgenic FGF19 mice have shown decreased liver fat content, improved hepatic and serum lipid profiles, and resistance to high-fat diet-induced obesity [31–33]. In addition, FGF15/19 induces hepatocyte proliferation  and has been recently identified as an important mediator of liver regeneration after liver resection surgery . Here we show that Salmonella infection disturbs the homeostasis of the FGF15/19-FGFR4 axis by down-regulating the expression of Fgf15, Fgfr4 and Klb. To our knowledge, these results constitute the first demonstration of a pathophysiological effect of bacterial infections over the FGF15/19-FGFR4 endocrine axis. Infection modified both the ileal expression of Fgf15 and the components of its hepatic receptor, which suggests a significant functional shutdown of the pathway. Our data rules out a direct cytopathic effect of bacteria over ileal enterocytes as the major cause of Fgf15 mRNA reductions. Instead, it is apparent that the decline in Fgf15 expression results from impaired activation of FXR in the enterocytes. Our interpretation is strongly supported by the observed low volumes of gallbladder bile and the decreased expression of Fabp6, Ostα and Nr0b2 (Shp), all well-known FXR targets. In addition, we show that the depletion of the intestinal bile acids pool by oral administration of the bile acid sequestrant cholestyramine is sufficient to significantly decrease ileal Fgf15 expression. Furthermore, intravenous infections with a Salmonella invasion mutant and with Listeria monocytogenes, both resulting in rapid hepatic colonization and pathophysiology, lead to reductions in Fgf15 expression in the absence of significant ileal bacterial colonization or enterocyte invasion. Salmonella infection induced a massive alteration of the hepatobiliary gene expression program. 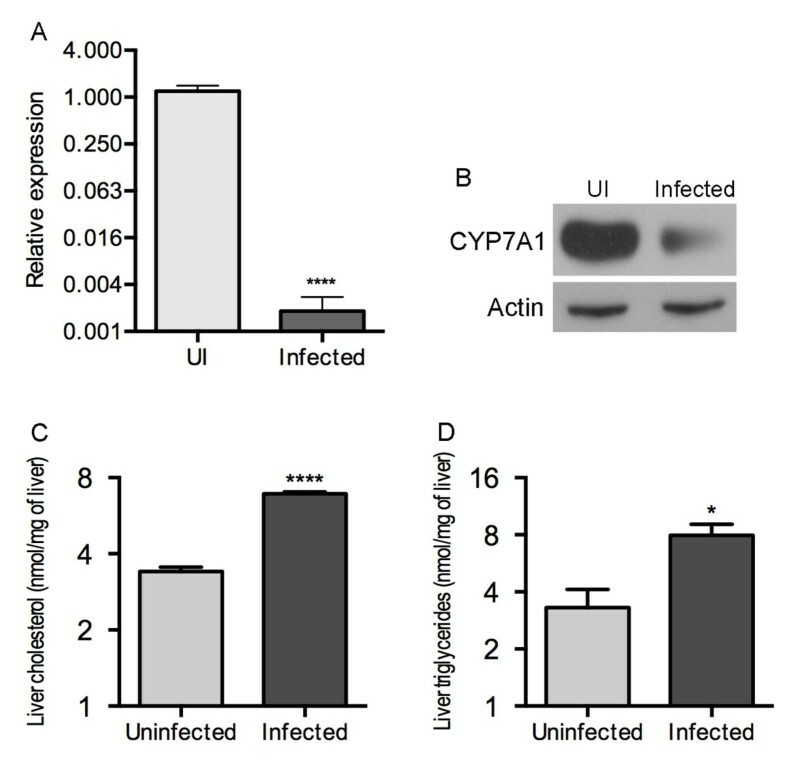 Remarkably, the mRNA and protein levels of CYP7A1, the rate-limiting enzyme in the neutral pathway of bile acids synthesis were decreased during infection, in spite of the lower levels of FGF15 which would be expected to promote the upregulation of Cyp7a1 expression. These results reveal the complexities in the regulation of Cyp7a1 expression and indicates that the mechanisms of Cyp7a1 expression control are hierarchical. Infection also triggered a significant reduction of FGFR4 and βKlotho, the two proteins involved in assembling the functional receptor for FGF15 in hepatocytes. The biology of FGFR4 and βKlotho had never before been studied in the context of a bacterial insult, and our data suggest that their function can be severely compromised by bacterial infections in vivo. The mechanisms underlying their downregulation are unclear at present but we anticipate that they are related to the pro-inflammatory cytokine burst that follows liver colonization by bacteria. It has been recently reported that TNFα represses βKlotho expression in adipocytes ; thus it is possible that a similar mechanism acts in hepatocytes. It is apparent that the dysregulation of the FGF15/19-FGFR4 endocrine axis components is not a general pathogenic feature of all bacteria, as infections with the enteric pathogen Citrobacter rodentium, the mouse model for human EPEC and EHEC , did not modify the expression of ileal Fgf15 (data not shown). Instead, this pathophysiological effect may be restricted to infections displaying a relevant liver involvement. Further work is still necessary to define the full impact of infections in FGF15/19 function and to determine the underlying molecular mechanisms. Through the alteration of the hepatobiliary function, bacterial pathogens of the enterohepatic system dysregulate the homeostasis of the FGF15/19-FGFR4 endocrine axis. These revealing findings have important implications for the understanding of the pathophysiology of microbial diseases. Disruption of the FGF15/19-FGFR4 pathway may be a contributing factor to the metabolic and nutritional disorders associated with infectious diseases. We thank Catherine Desrosiers, Melisange Roux and Elora Midavaine for technical help. This work was supported by grants to A.M. from the Fonds de Recherche du Québec-Santé (26710) and the Natural Sciences and Engineering Research Council of Canada (401949–2011), and to B.B.F. from the Canadian Institutes for Health Research. L. C. M. A. was funded by a postdoctoral fellowship from the Canadian Institutes of Health Research. A. M. is a member of the FRQS-funded Centre de Recherche Clinique Étienne-Le Bel. GR, ST, ETA and LCMA carried out Salmonella infections. GR performed the gene expression analysis, western blots and immunofluorescent microscopy. SC and ETA performed the cholesterol and triglyceride determinations. MTC carried out the Listeria infections. BBF participated in the supervision of the study. GR and AM drafted the manuscript. AM conceived the study and supervised its design, coordination and execution. All authors read and approved the final manuscript.